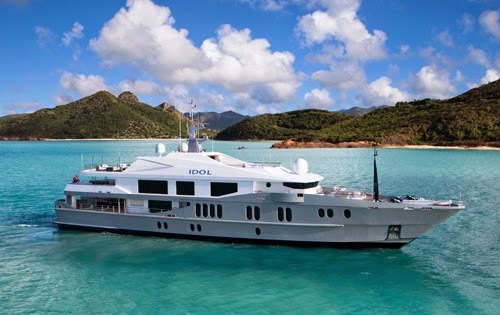 Idol is still available for charter from 15 - 22 July in Capri/Naples area and offers a special rate of €240,000 for the week! • Beach house including a 280 square meter sun deck with Jacuzzi. • Outdoor gym club and infinity terrace. • Large floor to ceiling windows. • 7 cabins which can accommodate 2 supernumeraries. • Enormous array of water sports equipment. • Spacious and contemporary interior. All cabins are the same in terms of colour, material and durnishing. The carpets are cream coloured with white leather head boards and bed boards. The beautiful MASTER CABIN is full beam and on the Maindeck with ensuite full beam bathroom with Spa tub, shower and bidet. The master is inter connecting to the study and also a double guest cabin with shower, ideal for a nanny or small children. Two VIP CABINS can be found on the Bridge deck and have ensuite with bath and bidet. There are three spacious DOUBLE CABINS below on lower deck. They are all 3 the exact same size.